Mold FAQs - Indoor Environmental Testing Inc.
Disclaimer: The mold information contained in this website represents professional opinions offered by Indoor Environmental Testing Inc. (IET). The information contained herein is for educational purposes only. The materials contained herein are not intended to be used for the diagnosis or treatment of a health problem nor as a substitute for consulting a licensed medical professional. Health information should always be carefully reviewed with your healthcare provider. IET will not be held responsible for misuse of information nor any adverse effects of recommendations stated in these resources. While it endeavors to keep the information up-to-date and correct, IET makes no representations or warranties of any kind, express or implied, about the completeness, accuracy, reliability or suitability with respect to the website or the information, products, services or related graphics contained on the website for any purpose. Any reliance you place on such information is therefore strictly at your own risk. Can One Determine The Species Of Mold Based On Color? Unfortunately, it’s not that simple, and there is no way to identify fungal species strictly based on visual observation or by color. Some species can have several colors, depending on the stage of growth. For example, a fungi could start out white, then turn green. Sometimes molds are the same color as the substrate on which they grow; this makes the mold invisible. For example, Aspergillus growing on the back of drywall often starts out white and is mistaken for drywall dust. A microscope is needed to identify it. This is the most commonly missed mold by homeowners and inspectors alike. Scopulariopsis, a common crawlspace mold, can be the very same color as wood, so it’s not visible on a floor joist unless the flashlight is held parallel to the surface to reveal the fuzzy growth, which home inspectors often mistake for dust or dirt. Also, just because mold is black does not mean that it’s Stachybotrys, the mold often characterized in the press as “toxic black mold.” Often, the “black mold” that people find on window sills or in corners of the basement is Cladosporium, the most common outdoor mold. One of the most toxic molds is often purplish pink (Chaetomium) which is easy to spot but it’s not always that color, it may start out as yellow! It doesn’t even look like mold and yet it can make occupants quite ill. The least visible mold is white, usually Aspergillus or Penicillium. It often covers furniture, leather goods and luggage in damp basements. It appears as a white “dust” until a well-positioned flashlight makes it clear that mold colonies are present. What Kind Of Testing Is Available To Find Hidden Mold? The world of mold testing is moving slowly – there is no CSI for mold yet – but we are making some progress, especially in the type of testing available directly to the homeowner. 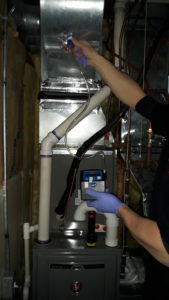 Of course, nothing can replace a really good mold inspector, but if you do not have access to one, there are some tests available to homeowners that previously were only available to professionals. All of the tests described below are available to you as Do-It-Yourself kits from us. Simply call 1-800-MY-AIR-TEST to order. Air Sampling: This type of testing is limited in its value but can sometimes help uncover mold problems. Typically, several indoor locations are tested as well as the outdoors. A lab report is provided that gives guidance on how to interpret the results. Interpreting test results is best done by a pro, but in a nutshell, what you want is an indoor ecology similar to the outdoors with close-to-equal or lesser quantities and similar ratios. In other words, the types of molds inside should be the same as found outdoors and in similar numbers. There are many ways to misinterpret lab results so beware. This test also gives you additional data like mold fragments, pollen count, skin-cell/dander count, etc. Unfortunately, air sampling is the single most popular method of testing among most mold inspectors because it is the simplest. There are numerous mold inspection services now offering a mold inspection which only consists of 2 or 3 air samples indoors and one outdoors. 90% of the time, this is a complete waste of funds as it will not detect hidden mold in HVAC systems, inside ducts, under the tub or kitchen cabinet or in wall cavities. This test can be helpful after a remodeling job, or mold-remediation work conducted by a professional or mold cleanup performed by the homeowner to get an idea of how much airborne mold is present. If mold counts inside are substantially higher than those outdoors, air flushing or air washing may be needed. Many things can cause a false negative, and a few can cause a false positive; that’s where a professional can help, but at least if one room shows 50 times the outdoor mold levels and the other rooms are similar to outside levels, then you have gained some valuable information and have narrowed down the area being affected by mold. Spore Traps: The most valuable use of spore traps is to detect mold in hidden places like wall & ceiling cavities, underneath vanities and kitchen base cabinets, inside the furnace or ducts, and to test mattresses and carpeting. A few companies offer rentals of professional equipment to collect air samples. You get all you need in one package, collect the air samples following instructions and then return everything to the company. Surface Testing, also called Tape Lift or Swab: With this type of test, a piece of scotch tape or a swab is used to touch a surface and collect the particles on that surface. The tape/swab is analyzed by a microbiologist, who will report the mold species found on the surface and the quantities for each. You would use this type of test if you see mold on a surface and want to know what kind of mold it is or if you see a suspicious-looking substance on a surface and want to know whether it is mold or not. TIP: When collecting mold onto a piece of tape, apply only enough pressure to pick up the mold, but do not press hard and crush it. Applying too much pressure can break up the spores, which would make the sample more difficult for the lab to read. This is similar to trying to identify a flower with a fraction of a petal vs being able to see the petals, leaves and stem attached. Mold Culture: This type of test can be accomplished using a swab or an air sample collected on a petri dish lined with agar. 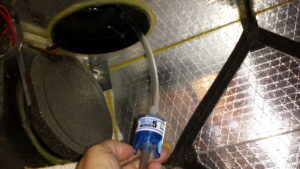 We like the swabs for testing suspicious surfaces like the A-Coil inside the furnace, the drip pan underneath the A-coil, air conditioner coils, humidifier membranes or any uneven surface to which applying a tape is difficult. Mold Testing with a Swab. Microbial VOC Test: This test detects the VOCs (Volatile Organic Compounds) produced by active molds. Molds emit a gas as a by-product of digestion. This gas is a VOC and can be measured in the air similar to formaldehyde or others. It can also be smelled by occupants. It’s the well-known “musty” odor that tells us mold is likely present. This test also has its limitations. A very musty basement, for example, may get a “negative” test result because the molds were just not emitting their gas at the time of the test, which collects air for about two hours. This test is available to homeowners, and all equipment is provided to collect the air sample. Preparing Collection Device for Culturable Air Sample. Mycotoxins Test: This test detects the chemical substance produced by molds (some mycotoxins, such as Trichocethenes, produced by Stachybotrys mold among others, are known carcinogens and can be toxic to the brain, liver, kidney’s, etc.). These toxins are not volatile on their own but they attach to mold spores, dust, and cling to surfaces. Collection of dust for this test is easily accomplished by the homeowner by collecting a piece of the furnace filter, collecting some dust from the vacuum bag, using a Q-tip to collect dust from surfaces throughout the home, or sending in a portion of an air-purifier filter. While this test is expensive, it is invaluable in determining whether the occupants are being exposed to mold toxins and can explain an unexplained illness including cancer. It is limited, however, in that it only confirms that mold was or is present but does not give a location for the mold. For this you need a professional to investigate. This test can be positive even if mold was found and then removed professionally. Improper or incomplete mold removal can spread large quantities of mycotoxins, so this test is very useful after mold remediation to determine the level of cleanliness and the extent of leftover contamination. Important recent research seems to point to mycotoxins as a component of biotoxin illness and this test is the ultimate test for health practitioners, especially if a urine test is also available to compare the types of mycotoxins found in the environment and those found in the occupants’ urine. This test is controversial however and its validity not widely accepted. The presence of mycotoxins can explain why someone is ill but it doesn’t shed any light on the cause/source or location of the mold. The presence of mycotoxins in the interior dust is not necessarily an indication that mold is present however mycotoxins should be removed since they are poisonous.There are a lot of fraudulent and/or ignorant claims on the internet about what does and doesn’t remove mycotoxins. ERMI, HERTSMI-2 (QPCR): This type of testing uses DNA technology to identify the DNA of the most common molds in household dust. It provides a historical picture of how much mold is in the household dust and very accurately identifies the types of molds present in the dust. It does not however assist in finding the location or the source or the cause of the mold and the results do not always give an accurate representation of what and how much mold is present. For example, a house could have substantial mold contamination in a wall or under a vanity and yet the ERMI test may show nothing abnormal. This is an all-too-common scenario. 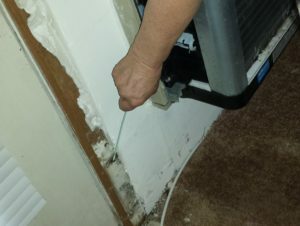 What often happens is that wall cavities or the back of the baseboards were not adequately dried. 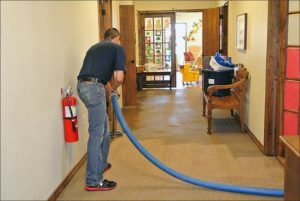 Some water-restoration companies cut costs by simply pulling up the carpeting and running blowers and heaters. 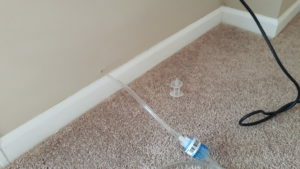 This works some of the time, but often, the wall cavities stay damp and grow mold. Six to eight weeks later, a musty odor develops as the quantity of mold behind the walls becomes substantial. Wall cavity testing will help to determine which walls are contaminated with mold. TIP: If your insurance company hires a water restoration firm after a basement flood, insist that, at the very least, workers remove the baseboard from all walls affected by the water intrusion. If there is a good amount of space between the concrete floor and the drywall/paneling, then the wall cavities have a chance to dry. If not, then holes can be drilled or the drywall cut out a few inches to allow drying and air circulation. Water Restoration Professional Removing Water From Wet Carpeting. TIP: When installing new drywall in a basement, it’s prudent (and it’s required by building code in some states) to leave a 2 to 3″ gap between the floor and the drywall, so if a water event occurs, the drywall is less likely to wick up water, and the wall cavities are then accessible for drying as needed. 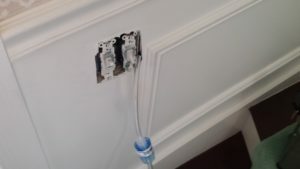 Wall cavity testing: Sometimes the wall interior can be reached by inserting a tube on the side of an electrical outlet box. The musty smell can also be from carpeting. Once carpeting has gotten saturated with water, the odds are low that it will be dried fast enough to avoid mold growth. Mold growth starts within 24-48 hours. Any dampness remaining in the carpeting after that encourages mold growth. We can test your carpeting to determine the level of mold present. This is accomplished by collecting dust from the carpeting and having the lab analyze it. One client had a basement flood which was remediated by water restoration professionals within 48 hours. The crew decided that the carpet could be saved so they only discarded the padding and thoroughly dried the carpeting. All looked good and no odor was ever detected. Three years later, the homeowner called to get mold testing in the basement because he didn’t feel good whenever he spent time in the basement. Air samples from ambient air and wall cavities showed no mold issues. The carpet dust was also tested. The lab reported 13 different species of mold in the carpeting! This is an example of why air sampling alone is insufficient in some cases. The carpet was dry so the mold was not actively growing thereby no odor was present but the molds were still present in the carpeting from the previous flooding and the spores were still allergenic, possibly toxigenic, and causing symptoms for this homeowner. Sometimes the musty odor comes from fungal growth on content, i.e., wood surfaces, cabinets, doors, upholstered furniture, exercise equipment, etc. Basements are not always well lit, and the air is often stagnant; two encouraging factors for mold growth. TIP: Mold growth on furniture is not obvious. Use a flashlight held parallel to the surface to make the invisible visible. Can I Clean The Mold Myself? Before cleaning up mold, obtain a copy of the EPA publication entitled Mold, Moisture and Your Home or go to the New York City Health Dept. website and read the Mold Remediation guidelines. They both offer detailed mold cleanup guidelines. Visit www.epa.gov/iaq/molds/moldguide.html to print a copy of the guidelines. The phone number for the EPA Indoor Air Quality Clearinghouse is 800-438-4318. We recommend do-it-yourself cleanup only for small and contained areas. You must first find and eliminate the cause of damp conditions (leaks, condensation, lack of ventilation, etc.). Fungi are normally microscopic. If you can see the growth, the infestation is advanced. It may be behind a wall and be more extensive than you think. While we do NOT recommend application of sprays,. chemicals, etc … people continue to use this method so … remember to ventilate the area when using any cleaning solution and remember that the only party who will benefit from this application is the party who sold the product to you. When working with mold, always use appropriate protective equipment (N-95 respirator, disposable coveralls, gloves and goggles). If the mold growth is on a hard, nonporous surface, remove the mold (by wire-brushing, scraping) and discard it in an outside trash can. Mold is not a regulated substance and can be disposed of in the same manner as any household refuse. Keep in mind that as you disturb the mold, it is likely becoming airborne and riding on dust particles that will later deposit on surfaces, so keep the movement to a minimum, or isolate the area with plastic containment or negative air pressure to force the air out. Once the mold is removed, any of the following products can be used to clean and sanitize the affected area: • strong detergent • hydrogen peroxide • Borax and water • Benefect, an EPA-registered fungicide TIP: One benefit of Borax is that it may retard or prevent future growth. Preliminary research has shown that mold is less likely to grow back on a surface that was previously treated with Borax. TIP: Once all mold is removed and areas have been cleaned, use of EC3 Mold Spray will eliminate most mycotoxins that may be present. While spraying bleach on mold seems at first to be effective, it rarely solves the problem, and most people find that the mold eventually returns. The latest scientific research has clearly shown that, not only is bleach not effective in killing mold, but the spores that are dead are still toxigenic and allergenic (capable of producing mycotoxins and causing allergies). Additionally, bleach itself creates fumes that are detrimental to the environment and can irritate the lungs and eyes. Mold removal can be dangerous and cause additional damage to a facility if not conducted in the proper fashion. For example, while attempting to remove moldy drywall on one floor, it is possible to contaminate an entire home by releasing millions of mold spores in the surrounding areas and to upper floors. The removal of the drywall could also cause the mold spores to be circulated throughout the entire structure via the ventilation system. It is generally believed by mold experts and confirmed by the U.S. EPA that fungicides are NOT effective in the removal of mold. Use of fungicides has its place in some remediation cases but only as one part of the remedial process. Removal of the affected substrate (drywall, studs, etc.) and complete removal of the mold should be the goal. OSHA (U.S. Dept. of Labor Occupational Safety & Health Administration) states that “As a general rule, simply killing the mold, for example, with biocide is not enough. The mold must be removed, since the chemicals and proteins, which can cause a reaction in humans, are present even in dead mold.” More at http://www.osha.gov/dts/shib/shib101003.html The U.S. EPA States: “The chemicals in mold and mildew removers can be very caustic. That is, these cleaners can be corrosive to objects and harmful to humans.” http://www.epa.gov/kidshometour/products/mold.htm The latest industry standards from the S520 Standard and Reference Guide for Professional Water Damage Restoration strongly discourage the use of chemical sprays of any kind in an occupied building/residence. For surfaces that are prone to dampness or mold growth, consider painting the surface with Caliwel, which is very effective for inner side of drywall, crawl spaces, and basements. Caliwel offers long term protection against mold, has low odor and it’s a zero-VOC product! Caliwell is available from The Green Design Center in Waukesha, WI. What products do you recommend to clean mold? Mold cleanup simply means removing the mold so technically just a sponge or rags would do the job but most of us like to clean and disinfect the surface afterwards. Along with advances in mold remediation techniques, less-toxic or non-toxic products have surfaced that are EPA approved for the task, very effective and much less harmful than the harsh chemicals of the past. Once mold has been removed from a surface, the surface can be cleaned with a number of products like soap and water, hydrogen peroxide, Borax and water (1 cup to a gallon), etc. Borax has the advantage of being a mold “retardant” of sorts, mold doesn’t seem to return as quickly on surfaces that have been treated with Borax. The advantage of Hydrogen peroxide is its white foaming action which gives the user a visual on whether the surface needs additional cleaning or not. My favorite disinfectant is Benefect Decon 30, an EPA-approved no-rinse sanitizer. This product can also be used to sanitize kitchens and bathrooms and it’s great to add to the washer to remove odors from clothing. For mold-sensitive individuals, the most popular product among customers is EC3, another phenomenal botanical that has been scientifically proven to eradicate mold mycotoxins. This line of product offers a laundry additive, EC3 candles, a mold spray and a liquid concentrate. It is ideal for individuals with mold allergies or individuals who have had mold remediation in the home. In most cases, EC3 spray will decontaminate individual items so the sensitive individual can keep the item rather than discarding it. This has worked on musical instruments, furniture and clothing. Porous items like upholstery, pillows and cushions, luggage, wicker/rattan and mattresses are more difficult to decontaminate and may have to be abandoned. In some cases where the surface is damaged or if the surface may be exposed to dampness again then encapsulation is beneficial. In this case we recommend coating the surface with Caliwel, a high-pH product on which mold cannot grow. Caliwel spray is also beneficial for mold-affected areas that cannot be cut out or reached. The mold should always be removed first before applying any type of coating however. I Bought A Mold-Testing Kit At The Hardware Store, and It Grew All Sorts Of Molds. There are numerous issues with these types of kits and mold testing in general. The field of mold testing is slowly evolving, but many aspects are still not well understood by mold professionals, by the public or by medical professionals. 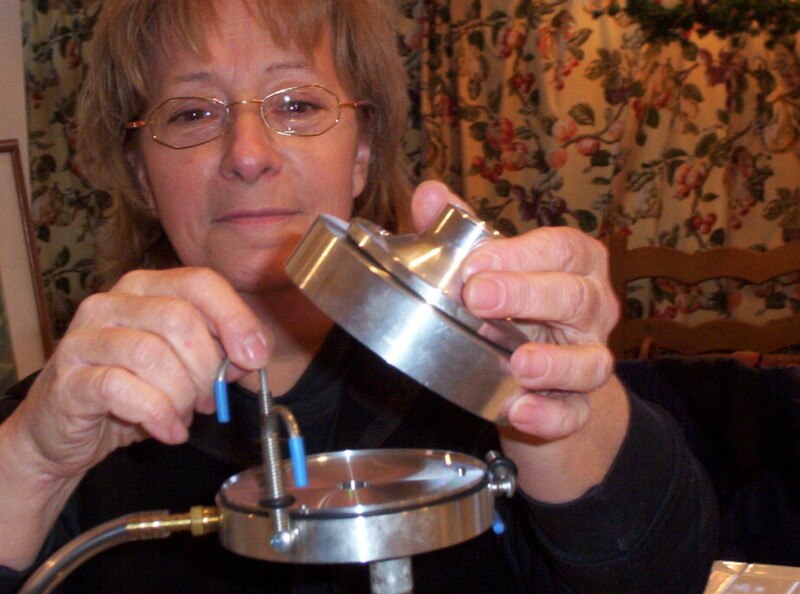 Mold-testing kits purchased at a hardware store use a type of testing that can be useful when used by professionals in a controlled setting with air sampling pumps. In a DIY setting however, they rely on natural airflow indoors to deposit mold spores onto a petri dish that has been coated with agar (a moist, sticky substance) to encourage captured mold spores to grow and reproduce. You pay $10 to $20 for the kit; then you can optionally send the petri dish to a lab and pay an additional $40 to $60 for the lab to tell you what species of molds were found on the petri dish and how many colonies were found. Depending on how much has elapsed, the ambient temperature and the quality and age of the agar, a number of mold colonies will grow on this petri dish. So this is a win-win for the marketers of these tests because these mold plates will ALWAYS grow mold unless the agar is old and has expired. This is a good money-making scheme with an ample supply of concerned homeowners who will send in the plates for lab analysis when they see the mold growth on the plate. 1. It only identifies the presence of “viable” molds (molds capable of reproducing or capable of active growth). A major factor is missing here: nonviable mold spores, those spores that cannot reproduce or grow on a petri dish, and mold fragments. Both of these can be highly allergenic and toxigenic. While these spores are capable of causing severe symptoms, they would never be detected with a home-test kit. 2. It does not quantify the mold present, which is a key component of mold testing. Why is quantity a key factor? Molds exist in every home, even in the cleanest of hospital operating rooms but quantity and ratio could be the difference between occupants feeling ill or not. A petri dish left sitting in ANY environment will grow mold. Professional tests are measured and compared to outdoor-air counts and ratios under strict guidelines using calibrated equipment. 3. They often overlook some of the most toxic molds like Stachybotrys, Chaetomium and Memnoniella. The agar does not support the growth of these species. The mold present in your house might be a species that requires specific conditions to grow, like heavy moisture and wetness not provided by standard petri dish agar. In addition, these highly toxic molds are those that may exist underneath a base plate (stud) in a basement after a sump pump overflow or underneath your vanity after a toilet or bathtub overflow. They will not fly out and land on the petri dish, and probably won’t even become airborne unless disturbed, but can emit strong substances like microbial VOCs and mycotoxins that can cause severe illness. Nowadays there are several mold tests available to the homeowner that provide better information. Mold DNA testing is not available for about $100 and provide much better information for consumers. You can conduct these tests yourself by following the instructions that are provided with the collection kit which can be ordered here. I Had My House Tested For Mold By A Professional. No Mold Was Found, But I Smell It. Current mold-testing methods are somewhat limited and often miss the mark. The most common types of testing employed by professionals today involve using “spore traps” or “tape lifts”. These types of tests focus on mold spores only. They completely ignore other substances produced by molds such as mycotoxins, microbial VOCs, beta-glucans, enzymes, and in water-damaged environments bacteria and bacterial endotoxins. Common testing also focuses on ambient air rather than where mold usually hides such as inside walls, ceiling cavities, HVAC systems, under basement stairs, in closets and in carpeting and insulation. But … what if a window leak is causing water to drip inside a wall cavity, and mold is growing on the back of the drywall, studs, and fiberglass insulation? Will the mold spores come out of the wall and float in the air to be captured by this test? This is unlikely but, depending on air flow currents inside walls, the other compounds produced by molds might, like the VOCs that produce the unmistakable musty odor. So the ambient air in the room tested “normal”, but when you sniff the electrical outlets in that room, you can smell the mustiness. This is an example where wall-cavity testing (often called a wall check) would be in order. Some professionals argue that wall cavity testing is unreliable because some walls that tested high on mold tests looked fine when they were opened. Often the bulk of the mold spores detected in a wall cavity are in the fiberglass insulation. The mold causes the musty odor but you can’t see the mold because it’s all in the insulation. Sometimes it is underneath the bottom plate (bottom stud) and there is no way to inspect the underside of that stud. There is no such think as a false negative when it comes to wall cavity testing, it’s there, you just can’t see it. The same applies to carpeting, especially in basements, where carpeting is installed on concrete. Concrete slabs emit moisture which, over time, may cause mold growth in the carpet. Once mold growth occurs on carpet fibers or in the jute backing, no amount of shampooing will get rid of it. It might even make it worse, depending on the cleaning method and how much dampness it created. Corners are especially vulnerable. Checking the tack strip for rusted nails and rotted wood in each corner is a good way to find out whether moisture has been building up. So the ambient air test may show normal mold-spore levels, but you can still smell mustiness in the room, in which case the carpeting itself should be tested. Results are difficult to interpret because most carpeting, depending on age, will show a good amount of mold spores in the test. The older the carpet, usually the more mold is found. The musty odor could also come from HVAC ducts or inside the furnace. 1 out of 3 furnaces we test has some mold contamination. A mold inspection consisting of air samples only will probably not detect mold inside the furnace. So the key is to hire a mold professional who will investigate based on your specific past water intrusion issues and test hidden places, not just the air. What Types Of Symptoms Can Be Caused By Mold? Penicillium- and Aspergillus-type molds are usually associated with respiratory issues, such as chest tightness, breathing difficulty or worsening of asthma symptoms, irritation of the nose and eyes, sneezing, sinus infections and the like, while Stachybotrys and Chaetomium have been implicated in episodes of mental fog, nose bleeds, ear bleeding, headaches, depression, memory loss, dizziness, extreme fatigue, liver and kidney damage and skin rashes. Burning eyes, nasal symptoms, and headaches have been reported with any species. These are general statements, and anyone with these types of symptoms should consult with their healthcare practitioner. Interestingly, new research is adding to the long list of symptoms suspected to be caused by mold mycotoxins. Mycotoxins are a chemical substance produced by some molds, and they have been associated with a wide range of illnesses and symptoms such as chronic fatigue syndrome or CFS, coughing, wheezing, shortness of breath, asthma, sneezing, burning in the throat, burning lungs and chronic sinus infections as well as confusion, cognitive impairment, vision problems, swollen glands, ringing in the ears, hearing loss, dizziness, muscle weakness, joint pain and muscle pain, irregular heartbeat, seizures, depression, anxiety, irritability, psoriasis, skin disorders, sleep disorders, coagulation abnormalities, sudden weight gain and more. Anecdotal evidence is plentiful that mold affects many people; some seriously. In our work, we interact with thousands of people each year who believe they have been affected by indoor mold. Lab analysis of air samples often confirms and validates their complaints, but we also see numerous cases of “mistaken identity,” in which a homeowner is reacting to other substances in the home or to substances from other locations. For example, a teacher was convinced her house was full of mold because her lungs would get tight and she would wheeze while at home but felt fine elsewhere. An investigation revealed that she had plug-in air fresheners in every outlet and was burning several candles each evening, all in a very small space where she spent most of her time. She also frequently used a leaky, air-polluting vacuum cleaner. Her symptoms improved almost immediately after eliminating these items. Mold testing and a thorough visual inspection revealed a normal mold ecology in the home. Sometimes people will avoid opening windows and introducing fresh air in their homes due to seasonal allergies from outdoor molds and pollens when, in reality, the symptoms might be caused by indoor substances like VOCs (Volatile Organic Compounds) and formaldehyde off-gassing from new furniture, carpeting and fragrances. In that case, fresh air is what is needed since it would dilute these chemical vapors. I Have Black Mold On My Walls, So It Must Be The Toxic Kind, Right ? Due to extensive media coverage of the poisonous black mold Stachybotrys, many people assume that all black molds are Stachybotrys. This mold was implicated in the deaths of several infants in the Cleveland, OH, area many years ago and has since received a lot of press. The Centers for Disease Control later retracted the story, citing tobacco smoke as a possible additional factor. It’s not uncommon for people who live with this mold in their environment to report nose bleeds and bleeding of the ear. This is a “potent” mold. One of our clients goes into a seizure-like state whenever she is exposed to it, and some mold professionals report being plagued with violent diarrhea each time they enter a building with large quantities of this mold. It’s important to note that color has nothing to do with potency or toxicity. Chaetomium, for example, is considered by some scientists to be even more toxic than Stachybotrys, and yet it grows white or peach when cultured. Many mold species are toxic. Actually most molds have the potential to be toxic, and the majority of molds are allergenic, so it has no place in an indoor environment, but just because mold is black, it does not mean that it is producing toxins or that it will cause symptoms. Therefore, mold species cannot be identified based on color or by visual inspection; a microscope is needed to discern each species. If I Suspect That I Might Have Mold Inside A Wall Cavity, Can I Just Cut A Hole In The Wall And Look With A Mirror And A Flashlight? Yes, but there are several caveats with this method. The first one is the potential exposure to poisonous mold toxins. A wall CAN contain large amounts of harmful mold, which will be seriously disturbed by the cutting and will likely become aerosolized as soon as the drywall is removed. Once the opening is made, the exposure is much higher. Mold spores are now free to transfer into occupied spaces – this could cause the entire structure to become contaminated, especially if the furnace or air conditioning is operating. Secondly, mold is not always obvious. For example it could be underneath the base plate (bottom stud) and not visible from above, or it could be white and not visible against the white drywall, giving the homeowner a false sense of security. Sometimes the majority of the mold is in the insulation that got wet, and this is not visible. A more accurate way to check would be to hire a professional who will use moisture meters to measure the moisture content of the substrate and collect some air samples from the wall cavity for lab analysis. This method is not foolproof but has a good track record for identifying contaminated walls. Tip: It’s important that your mold-remediation professional use the lab test results to guide the mold removal efforts. Again, mold is not always going to be visible if it’s under the base plate or in the fiberglass insulation. If test results show a high mold count inside a wall, all necessary precautions should be taken, even if the mold cannot be seen. Typical scenario: A homeowner discovers mold, usually in the basement or in a closet, calls a mold remediator, who comes in and promises to “eradicate” or “kill” or “encapsulate” the mold with a spray, pesticide, antimicrobial or antifungal, etc … The contractor is hired, and all is well … except that the odor never went away, or if it did, it was very short-lived. The homeowner has spent thousands of dollars with zero results. What went wrong? Promises of a quick fix are really tempting and attractive. Homeowners don’t like to hear that all their drywall has to be ripped out; that their house has to be subjected to noisy air-scrubbing machines, large vacuums and plastic containment, so when someone comes in with the promise of a much easier solution, like a spray, enzyme treatment, essential oil bomb, or encapsulant, it’s tempting. The only caveat is that when it comes to mold, no spraying method has consistently been proven to work. Worse, many homeowners were made ill by sprays. Even enzyme formulas can cause allergies/reactions in occupants, in the same manner as some people may react to enzymes in laundry soap. Ask yourself this: If you had a cancerous tumor inside of your body, would you prefer to have it cut out and removed or just sprayed with something and left there? REMOVAL is the word when it comes to mold. For every mold job that was completed successfully, there are probably 2 that were botched. Maybe the mold was sprayed instead of being removed. Maybe the mold behind the wall was cleaned but but the insulation was not removed. This is a bad one because fiberglass insulation inside a moldy wall contains the largest quantity of spores. Even other types of insulation can have mold on their surface but not be visible like the pink or blue foam board. Maybe the mold was removed from one area but missed in other areas such as under basement stairs, on floor joists in crawlspaces, behind insulation in sill boxes or inside wall cavities. Sometimes the mold is in the ducts, behind a shower or bathtub, underneath the vanity behind the toe-kick or some other hidden location. There are several facts about mold that should help you when selecting a method for mold remediation. 1. Dead mold is still toxic and allergenic. Dead mold is quite capable of producing and emitting mycotoxins and numerous other allergenic and poisonous vapors and by-products. A case in point is the ancient Egyptian tombs, in which scientists recovered deadly molds dating back thousands of years which still cause harm. “Killing the mold” is a precaution one might take to make the mold less infectious, but it is never a substitute for removal. 2. Sprays rarely kill the underlayer and roots. When mold is sprayed, only the top layer is affected. More layers and roots underneath are unaffected and will continue to thrive, given the proper ambient temperature and humidity. As a matter of fact, given an adequate amount of moisture and food such as wood, mold will grow right through paints, fungicides and other encapsulants. 3. Most fungicide sprays are toxic. Finally, unless the agent being sprayed is botanical, there is a likelihood the spray itself contains harsh chemicals that can make occupants ill. Several homeowners in the Madison area were forced to evacuate their home after a fungicide was applied to their ducts for example. What If Mold Is Found, Then What? Molds are present in outdoor air at all times, and finding some mold spores in your home or office is not necessarily a cause for alarm. High quantities of mold can cause symptoms, as can small amounts of toxigenic and/or allergenic species. They can affect the occupants, depending on the individual’s immune system and sensitivity. It is suspected that chronic exposure to large amounts of mold or to toxic molds like Stachybotrys and Aspergillus are detrimental to health and will eventually affect the occupants, whether they experience symptoms or not. Field observation also seems to indicate that prolonged exposure to a certain mold can cause the occupants to develop an intolerance or allergy to that mold. New evidence seems to point to fungal by-products as the possible culprits in adverse health effects. Known by-products of mold are Microbial Volatile Organic Compounds, also called MVOCs, mycotoxins, endotoxins (from accompanying bacteria), glucans, etc … Research is ongoing, but since mycotoxin testing has recently become available, their level in humans seem to correlate with illness and they are suspected of being the culprit in many chronic illness like Chronic Fatigue Syndrome and Auto Immune Diseases. Certainly animal-based research found that to be true for animals with many deaths attributed to mold mycotoxins animal feed. More research is needed in regard to endotoxins, which have not been on the radar but need more research. If the amount and type of mold found are greater than typical or expected levels, we will advise you on remediation procedures to remove the mold. If the damage is extensive and you choose to hire a mold-remediation company, we will work with the remediators to develop a protocol (detailed instructions) following generally accepted standards and procedures for mold removal. This protocol will specify where we found the mold, how it is to be removed and what precautions should be taken in order to not contaminate the structure. Once the remediators have completed their work, we will come back and re-test to confirm that all areas are clear and that ambient air mold levels are acceptable. How Do I Determine That The Mold Has Been Successfully Removed? Once all remediation efforts are completed, post-remediation verification testing should be conducted. This should be performed by an independent party not associated with the remediation party. Surface and air samples should be taken again, possibly at different times of the day, to ensure that all contaminants have been removed. The remediation professionals may conduct their own tests during the cleanup process or at the end of the job, at their own expense. However, an independent assessment and evaluation of the remediation work is well worth it for peace of mind. About 60 percent of the mold-remediation jobs we test do not pass clearance, and the contractor must return for further mold removal and cleanup work. For individuals with Chronic Fatigue, MS, Lyme Disease, Biotoxin Illiness, testing for mycotoxins should also be included. Mold will return if the source of dampness has not been remedied or if some mold is left behind.